Here Lawrence (far left) sits with a group of marakate (plural) around a ritual fire. Tradition is a word that points to a broader context for the healing work that Lawrence offers. As a marakame or healer and ritual leader in the Huichol tradition, Lawrence is part of an ancestral path that has existed for many generations. He is also affiliated with the Sacred Fire Community, an international organization that exists to bring more heart and connection in the world. The Huichol people still carry the “original instructions” about how to live a joyful life in harmony and balance with the living world. This kind of wisdom is not just the product of individuals; rather, it is possible because a whole people have been following in the footsteps of their ancestors in conducting rituals, doing healing work and living in community over a very long period of time. Being part of a tradition means learning from, and being accountable to elders. Elders are those who have walked the path before and who demonstrate their wisdom and willingness to make personal sacrifices for the benefit of their people. These elders include Tsaurirrikate (elder shamans) Eliot Cowan, David C. Wiley, and Don José Sandoval. Lawrence receives ongoing support from these elders and he follows a strict code of ethics like all healers and ritual leaders who are recognized by the Sacred Fire Community. In a Huichol village, community is a given: No one is anonymous, and there are always opportunities to come together for projects like harvesting the corn or engaging in frequent ritual to give thanks to the gods and maintain the well-being of the community as a whole. This is in stark contrast to the modern western world where we tend to live in isolation. The purpose of the Sacred Fire Community is to once again foster connection and the sense of deep community in the modern world no matter what spiritual affiliation a person may have. Following an ancestral path and being part of the Sacred Fire Community provides Lawrence with a framework of support for the work that he offers. Tending fire is about maintaining the flame of ancestral wisdom in a way that anchors community and healing. Whereas our prevailing western culture values what is new and different, ancestral traditions point to the timeless quality of creation. This encompasses our essential identity as human beings as well as the exquisite beauty of the world around us. 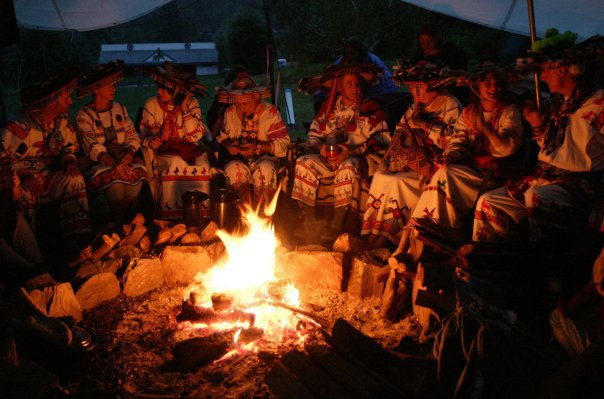 Tending fire means creating a healthy space for individuals and this necessarily includes a sense of a connection to a broader community.